Henry Louis Gates, Jr. is a popular and revered scholar who has written many acclaimed books and made many acclaimed documentaries about black history (and was also forced to drink a beer with the white cop who arrested him in his own home, because that’s America for you). However, he is now most famous for letting the now-single life-ruiner Ben Affleck hide his slaveholding ancestors from the world to spare Affleck the shame of being a white American with a past. This is a classic cautionary tale. The lesson here is that celebrities ruin everyone who comes into contact with them. If you are someone with a reputation to maintain, you should stay far away from famous people because they will torch that hard-won status immediately, often without even knowing they are doing it. 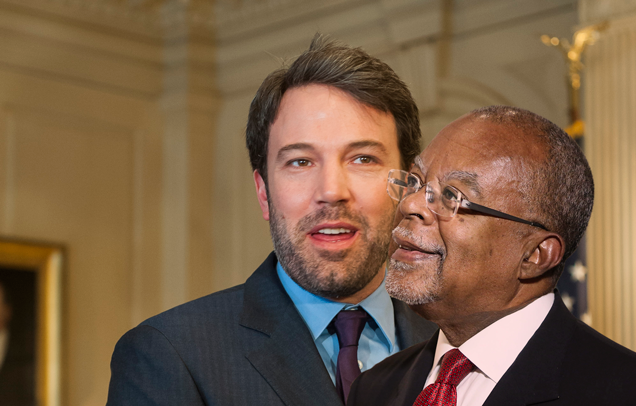 Henry Louis Gates has learned this lesson the hard way. “Finding Your Roots,” his PBS genealogy show on which notables like Tina Fey and Nas find out what their long-dead relatives were like, has been shelved, with apologies all around. It’s one of the more esoteric pieces of celebrity flotsam to surface from the giant Sony email hack. Gates was done in by a disastrous series of emails with Sony Entertainment CEO Michael Lynton about Affleck. In case you missed the kerfuffle: Affleck discovered through the show that, way back, his family owned slaves. He was not amenable to this information being shared with the world, because slavery is wrong and Affleck is above such things as being connected to America’s horrific history. He told this to Gates, who agonized with Lynton over whether or not to honor his famous guest’s demand. Gates then cut all references to slavery out of the Affleck episode, though he said he did it because he found more interesting material. Nobody knew about any of this until the emails were uncovered in April. However, the fascinating thing about the Gates-Lynton emails is that you can see the honorable professor taking a flamethrower to his integrity in real time. The two seem genuinely chummy, and much of the correspondence is pretty innocuous stuff (“Where and what is Coachella?” a puzzled Gates asks in one), but then there are the exchanges where it’s clear that Gates wants a bigger seat at the Hollywood power table. One of my favorite recurring threads is Gates’ desire to become a member of the Academy of Motion Picture Arts and Sciences (that’s the Oscars people to you and me). He asks about it in November of 2013, and then again in January of 2014, and then they talk about it again in July and August. We had discussed the Academy nomination a while ago, but I don’t think I ever got back to you about a seconding letter. I have a ton of friends in the Academy, but Jodie Foster probably knows me better and has known me longer than anyone else who is a member. She was my student at Yale, I directed her senior thesis, and she baby-sat Maggie and Liza. I had a dinner party for her and her wife, Alex, on the island a couple of weeks ago.... Meryl Streep and Doug Limon would write as well, I would think. But you might try Jodie first. He’s clear about how much he wants it: “I would love that!” he enthuses in another email. IMO, absolutely no chance. Its all traditional television. Not even the hook (ala Plepler) that some docs went theatrical before tv. These are PBS SHOWS. Tv Academy no problem, but if they let him in the Mo Pic Academy, every tv guy alive could claim. There is nothing even to base a rational argument on, except that he is “famous”. Don’t take the case counselor, it’s a dog. And yet. Gates acquiesced. You can’t accuse him—a Harvard professor, Emmy-winning documentarian, MacArthur genius grant recipient—of not knowing what he was getting into. After all that, he did exactly what Ben Affleck told him to do. Now, he’s the most famous black studies professor in America who colluded in the suppression of a story about slavery. Seems like a high price to pay for keeping Ben Affleck, AKA Batman, happy, and a great example to set for his Harvard students. Jack Mirkinson is a writer in New York.